Cemetery Management Software Demo CD today. 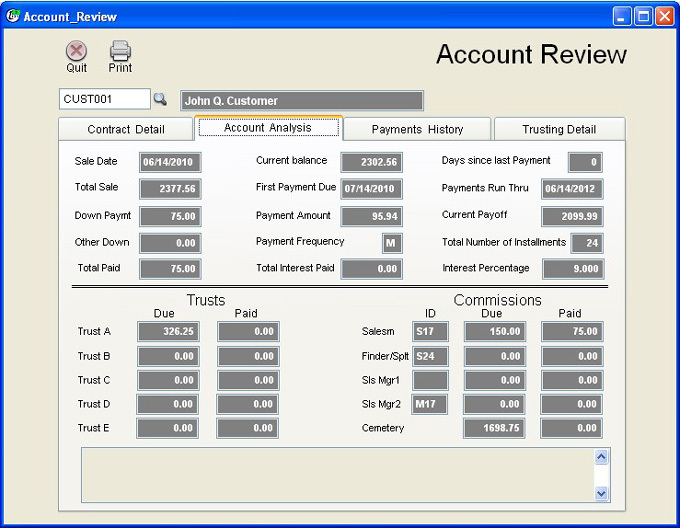 Legacy Mark’s Account Receivable system is a specialized and extremely functional tool for the cemetery bookkeeper and manager. The program address’ tedious complex calculations such as commission schedules, trusting, invoicing, statement issuing, contract writing, inventory control, accounts receivable processing, and much more. The goal of the Accounts Receivable program is to shorten the time spent handling the day to day tasks of bookkeeping thus allowing more time to be spent utilizing the array of reports helping you to better understand the viability of your outstanding receivables. 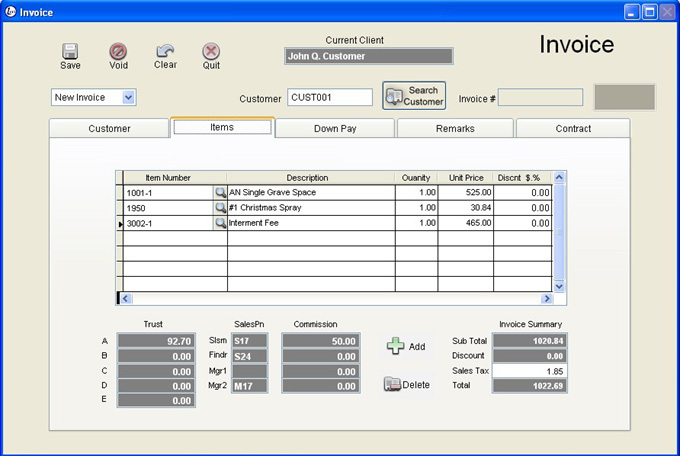 Invoices and credit invoices (sales returns) that can be printed and given to a customer at the time of transaction, saved for archival reasons and/or emailed. The invoice is capable of showing the itemized purchased items, down payment, discounts, applicable taxes, basic contract terms for payment schedules, and allows setting cycle dates and dates as to when to start charging interest. The invoices may also be branded with your cemetery logo. Commission Schedules have the potential to be a huge time consuming task but with Legacy Mark’s A/R program the job is taken care of in a few simple steps. With well over 20 years in the cemetery industry Legacy Mark has seen about every style and favor of commissioning used. A/R offers the flexibility of cascading commissions, percentage commissions, quota systems, multiple payees, and extensive reporting on salesperson activity and productivity. The Installment Loan System presents a convenient, easy-to-use method for handling pay-over-time accounts. It accommodates any interest percentage and is flexible enough to handle varying compounding periods. Customized Statements are generated in pdf format so you may print and mail, email and/or store a digital copy for your records. 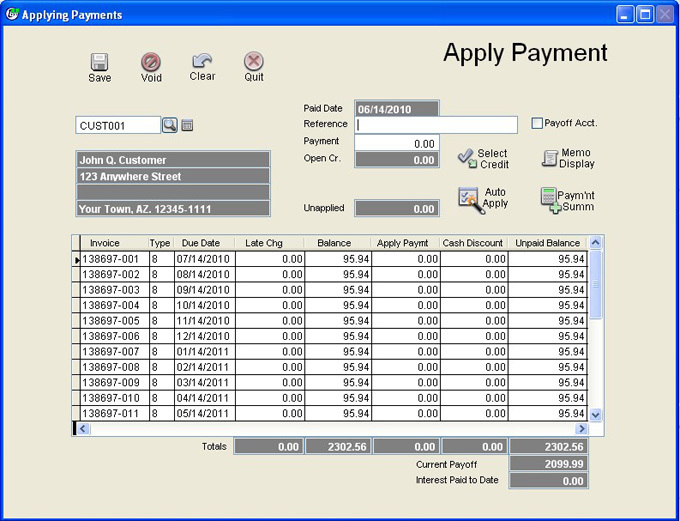 The statements contain account balance, amount due, due date, customer number, interest, comments, invoice number, and may be customized to show most any data within the database. Payment Booklets can be printed in lieu of statements or in combination with depending on your customers needs. Bad Debt Write Off is easily performedandA/Rcontains numerous reports and aging schedules to help evaluate your receivables. Cash Refund is available for credit invoices with credit balances remaining. View Customer Sales History for 12 monthly periods of prior or current years. 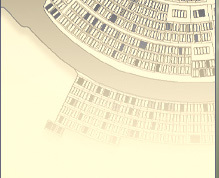 Applied Credit and applied finance charges can be voided. 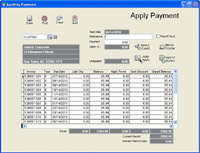 Rapid Apply-Payment Screen automatically shows and distributes payments over the remaining open balance items. The same screen also creates a credit for over payments and distributes any credits over the remaining open items. 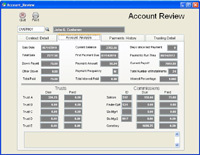 Account Review Summary quickly and efficiently shows all information pertaining to a customer on a single page. This page shows all information needed to answer the majority of questions a customer could ask. 35+ Different Reports are available in A/R including: Sales Tax Reports, Sales Comparison Reports, Salesperson Sales Quota Reports, Cash Refund Reports, Commission Reports by Customer, Salesperson or Contract, Differed Commission report which lists Customers, Commission Due and Paid, Trust Reports where 5 separate Trusts are maintained and Controlled, Differed Trust by Customer and Contracts, Paid-In-Full-Account-This Period with Differed Trusts Printed and Totaled.